Are you opening a new coffeehouse? You know your beans, you’ve got a supply of flavored syrups, you’ve rented out a great coffee shop location, and now…you need to lay out your overall look and design. Here are some pointers for your coffeehouse design. 1. Plan an efficient service area. When your guests walk through that door, you want them to instinctively know where they order their lattes. Make your menu easy-to-spot and read, and always staff a friendly associate who can greet them, take their order, and process their payment quickly. Also make it really obvious where your customer will wait for their order and where they’ll be picking it up at (usually the other end of the counter). Great signage will aid in the customer’s overall ordering experience. 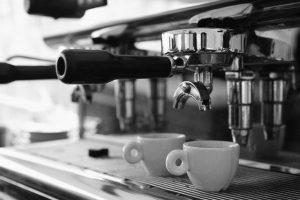 Think out the placement of your behind-the-counter equipment and supplies, so your coffee baristas are as efficient as possible. Is there an area with napkins nearby? What about hot cup sleeves? While there are a lot of reasons why someone may walk into your coffee shop, everyone who does expects great and efficient service. 2. Know your brand, and set the mood accordingly. Do you want to be the cheerful coffee shop business folk stop on their way to work to wake up every morning? Do you want to offer a chill place for writers and creatives to come and spend hours doing work? Do you want to be the social hangout for young coffee connoisseurs, or a great place for college students to come to study? Maybe you are mom-friendly and targeting families with young kids along. Choose what niche in the market you’re going to serve and know what mood you want to set for your coffee guzzling guests. This is the most important part of choosing a design layout. It will also help you with your overall coffeehouse marketing once you launch. 3. Colors and lighting need to match the mood. If you’re aiming to be the spot people go to wake up, then you may want to try bright lighting against yellow or orange walls. If you’re going for the laid back environment, you may want dimmer lights and darker burgundy and green walls for a more cozy feel. Let your brand dictate the mood of your accessories and artwork, too. 4. Look at the space’s unique features. Do you have a fireplace? How about a bay window? Are you setting up a stage area for local musicians? Or showing off some large screen TVs? Where are your electrical outlets for guests to charge laptops? Looking at the different areas or focal features of your particular room will help define where your guests will want to sit. You will also need to decide where you will place your wireless router and if you want to offer free Wi-Fi that is unsecured or require a password. 5. Choose the right furniture layout. Once you know what your mood is and have picked out all the unique features to your space, it’s time to shop for the right coffee shop seating for your new place! Most coffeehouses choose a mixture of restaurant tables and chairs, along with lounge seating for a more comfortable feel. We recommend setting up conversational clusters of furniture around your designated unique features, then filling in extra space with the tables and chairs. For more variation, try mixing some high top bar tables with your standard tables. While most coffee drinkers will need just a small 18″ or 24″ table top for their mug and muffin, don’t forget to use at least one or two large tables to accommodate business meetings or study groups in your place – maybe these are set toward the back or in an out-of-the-way section of the room. By thinking about your seating in groups or clusters, you can provide separate areas to create a quiet coffeehouse vibe for people working on their computers but also offer a social space for groups of friends trying to catch up after a long day of work. Once you have a layout in mind, consider the seating count and make sure it’s a number you like. If you want fewer or more seats, then revise your plan until it’s just right. 6. Decide if you will offer outdoor seating. Sidewalk cafes are quite popular, so if you have the room and can get a permit, try adding some small outdoor tables to your overall design, or forgo the cafe tables and simply offer some relaxing Adirondack chairs. These chairs have a wide enough arm to make sipping coffee and reading the morning news easy and comfortable. Outdoor seating can increase the total number of people you can serve at a time and also create another cluster of seats to give your guests the great conversational space they’re looking for from their local coffee shop. When designing your space, just ask yourself if you would be comfortable grabbing your morning espresso at your new place. Most likely, if you get a great feeling walking through the doors, your guests will, too!